Today there are about 600 different types of pasta and almost every supermarket in every corner of the world offers a really wide range of products. New shapes are frequently introduced or revived. It is one of the most popular products in the world for sure. However it is still the Italians who love pasta the most. They say that pasta is like poetry. 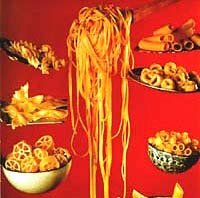 They love it so much that there is even a museum just for pasta, the Museo Storico Degli Spaghetti in Pontedassio, Italy.